Mastering meringue ultimately takes the finessing that comes only with experience. Still, the foolproof tips and techniques explained below can shorten your learning curve. Remember, practice plus patience makes perfect, and if you have to start over, keep in mind, it's just eggs and sugar. Cold eggs are easier to separate, but room-temperature whites attain more loft when whisked. Separate the eggs while cold, and then let the whites stand, covered, at room temperature for at least 30 minutes before beating. Crack eggs on a flat surface, such as your countertop, rather than the edge of a bowl. This reduces the chance that a shard of shell will puncture the yolk. Carefully separate 1 egg into two small bowls -- one for the yolk, one for the egg white. Evaluate the egg white to determine if it's free of impurities before adding it to a larger mixing bowl. Repeat process, working with 1 egg at a time. With this strategy, if a little yolk lands in a white, you'll contaminate only one white, rather than the entire batch. Make sure your bowl and whisk are clean and dry. Plastic bowls may retain hidden traces of fat from previous uses, so it's best to use a copper, glass, or metal bowl. Many chefs prefer using copper bowls because a chemical reaction between the copper and egg whites tends to produce a fluffy, more stable foam. Just before using a copper bowl, clean it with salt and lemon juice or vinegar, then rinse with cold water and dry thoroughly. Some meringue recipes call for a pinch of cream of tartar. This small amount will mimic the chemical reaction that occurs when egg whites are whisked in a copper bowl. While not necessary, it makes the meringue stronger and less likely to deflate. It may take a while to coax egg whites to a frothy, cloudlike consistency. 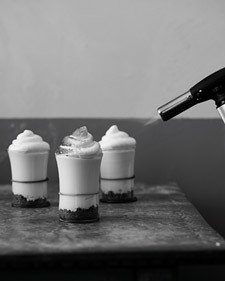 Beaters with many tines, such as standing mixers' whisk attachment or a handheld balloon whisk, will incorporate air into the mixture faster and more efficiently than a standard whisk. A standing mixer also tends to yield a more stable meringue. If beating by hand, use the biggest, finest-wired whisk you can find. Many chefs believe that hand-whisking whites in a copper bowl will not only lead to fluffy, more stable whites but also will reduce the likelihood of overbeating. Hold the bag at the top and squeeze lightly so you don't deflate the meringue mixture. (If the meringue doesn't peak, it was probably overwhipped.) And don't touch the tip of the bag to the parchment paper or you'll lose volume. Meringue sometimes forms beads of moisture or liquid on its surface. This usually results from overcooking. Try increasing the oven's temperature and decreasing the baking time (this prevents the internal temperature from becoming too hot). Keep in mind that too high a temperature may cause the meringue to brown slightly. Sometimes a small pool of liquid forms between the meringue and another layer of a dessert, such as a pie filling; this is referred to as weeping. To prevent this, never spread meringue over a cold filling. Instead, spread the meringue over the filling while it's still hot. The filling's heat will help cook the center of the meringue. Meringue that's smoothed over pie filling sometimes shrinks from the edges after baking. Be sure to anchor the meringue by spreading it all the way to the crust. To determine exactly when a baked meringue is done, lift it off the baking sheet. If it pulls up easily, it is ready. If not, continue baking, checking for doneness every few minutes. Meringue can be folded into cake batter, mousse, curd, or a semifreddo to lighten the texture. Tip: Fold in the meringue in portions, rather than all at once. 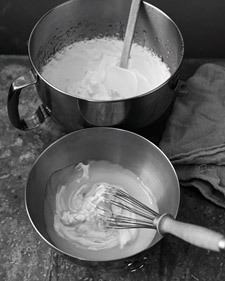 Gently whisk in one-third of the meringue until it is completely combined (this is called lightening the batter). The remaining meringue will then fold into the lightened batter more easily. To give meringue a golden, crisp exterior and a soft, warm, marshmallow-like center, whether atop a pie or lemon-meringue semifreddi, toast it lightly with a handheld torch. Alternatively, place the desserts (be sure to use heatproof dishes) in a 500-degree oven, and bake just a couple of minutes until the meringue begins to brown. You can also broil it until browned. Avoid making meringue on humid days. The sugar in the delicate egg-white mixture readily absorbs moisture from the air, which makes it soft and impossible to achieve thick, stiff peaks. Humidity may also cause some soft meringues to weep or crisp meringues to soften once baked.